This is part four of our five-part blog series that recreates the research from our June 11th Introduction to Investment Research webinar. 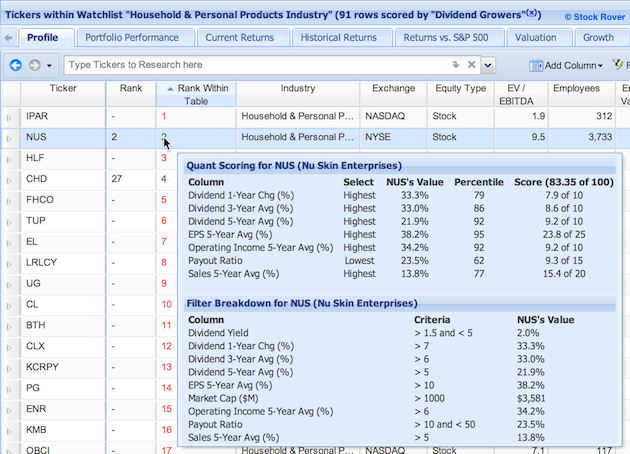 In posts one, two, and three, we got a feel for the market, used a ranked screener (formerly called a quant screener) to zero in on a stock, which was Nu Skin Enterprises (NUS) and then performed in depth research on that stock, respectively. But now, we want to look at our stock’s peers—who does NUS compete against? 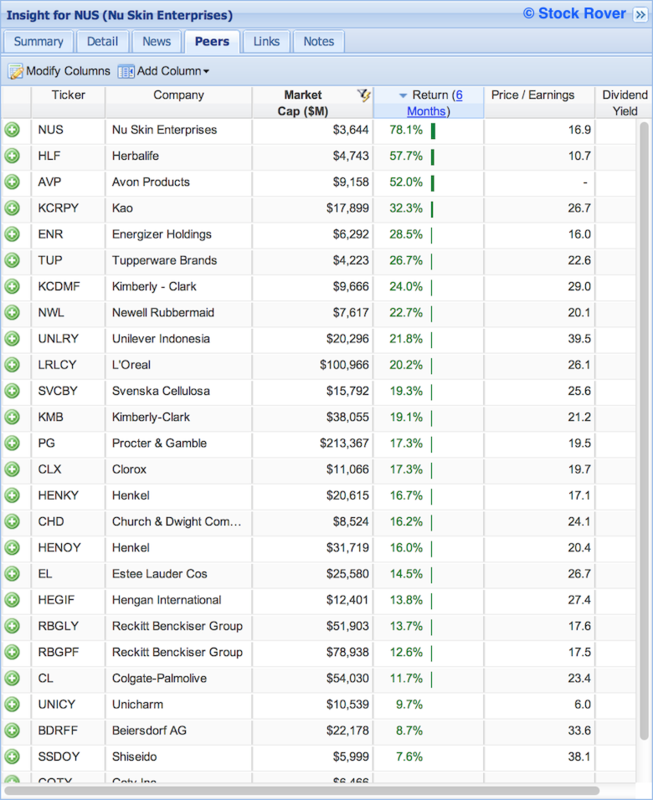 For this, we go to Stock Rover’s peers tab in the Insight panel, which lists all the stocks that are in the same sector and industry as the selected stock. 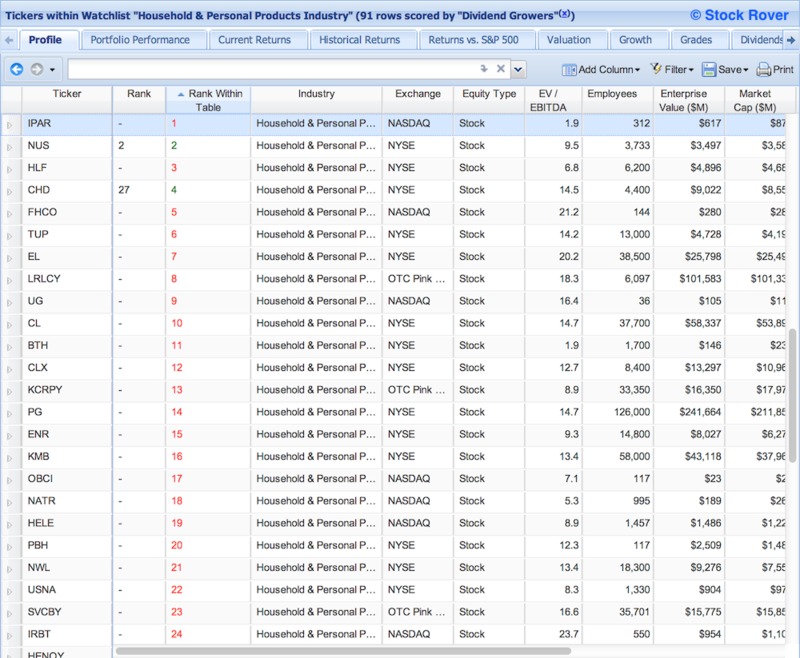 What’s more, this tab operates just like the Table, so you can view these stocks with any of Stock Rover’s metrics, sort them (by clicking the header), and filter them (by right-clicking the column header and selecting from the drop-down menu). Below we have NUS’s peers filtered to only those with a market cap greater than $2 billion, and sorted from largest to smallest. NUS is actually the very last row just out of sight here, so it’s the smallest of its peers when we impose this filter of market cap greater than $2 billion. 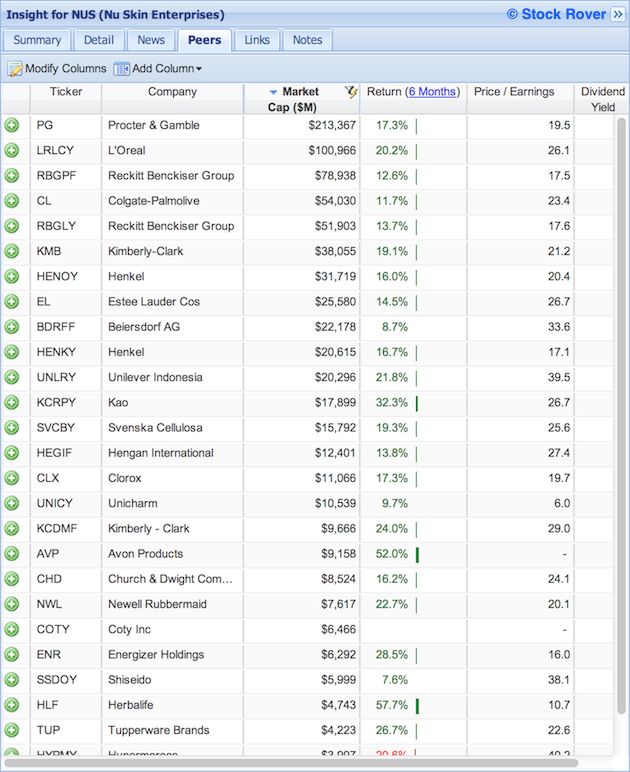 Proctor & Gamble (PG) and L’Oreal (LRLCY) top this list, no surprises there as they are by far the biggest in this industry. But what about when we sort by return over the last six months? Here we can see the NUS tops the list with a six-month return of 78.1%, but Herbalife (HLF) and Avon (AVP) are the only other stocks with a six-month return of over 50%. Which makes me wonder, did these stocks pass the original ranked screener, and where do they rank according to the ranking criteria within their industry? 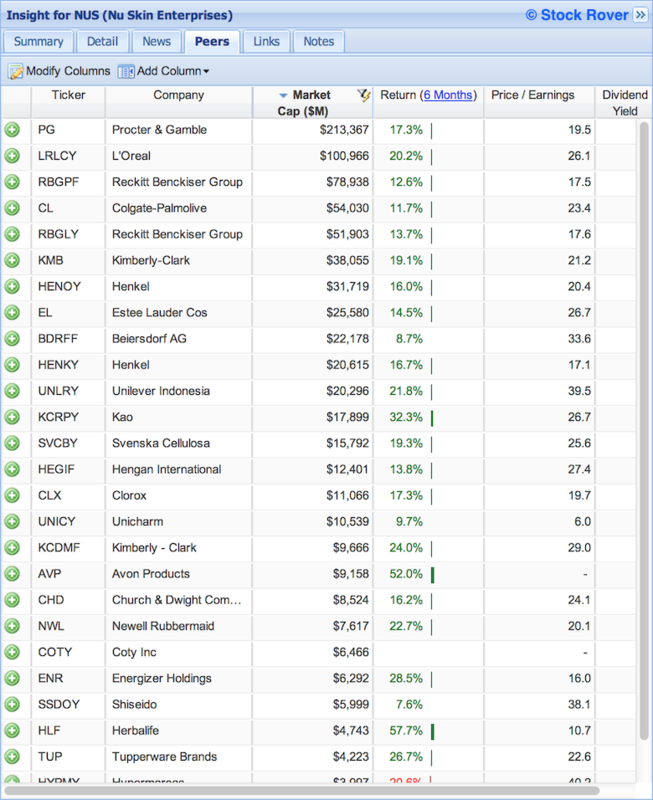 To find out, we can actually run our original Dividend Growers ranked screener just on this industry to see where they all land according to our weights. 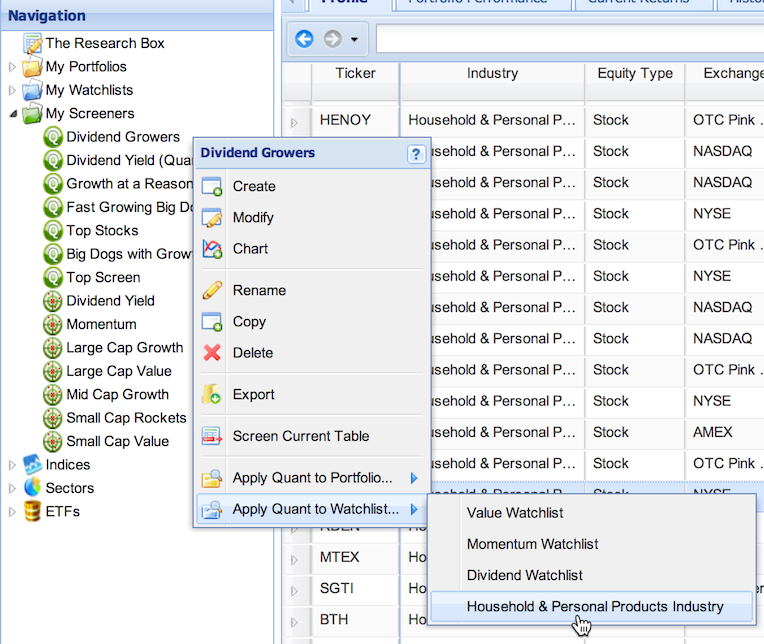 One way to do this is to save all the stocks in NUS’s industry as a watchlist. 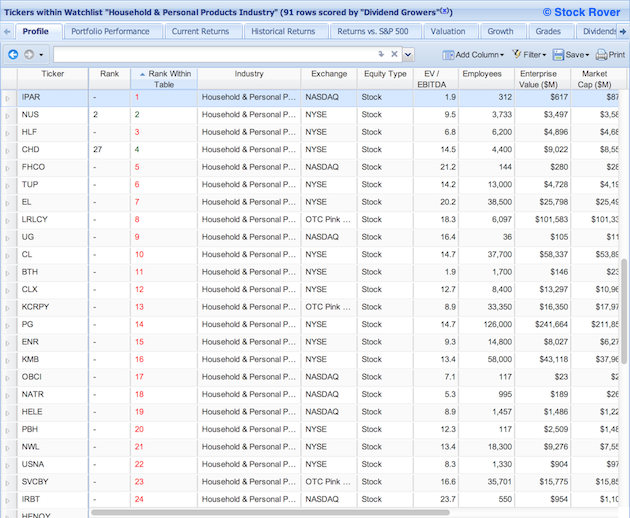 So we can either click this folder in the Navigation panel to get all the Household & Personal Products in the Table, or a shortcut is to click the industry name under the industry column in the Table, which is hyperlinked and will automatically load the stocks in that industry in the Table. Once they’re there, we can save them as a watchlist with the “Save” button in the Table’s toolbar. Now, to run the screener to rank the stocks in this industry, we right-click the quant in the Navigation panel, go to “Apply Quant to Watchlist” and select our newly-created Household & Personal Products watchlist. 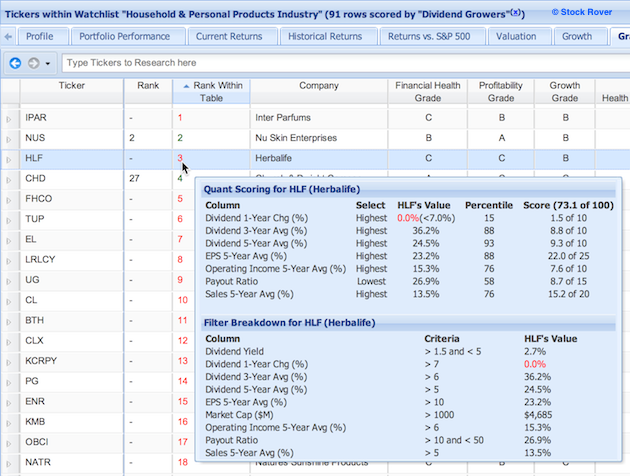 We can see that HLF is right up there underneath NUS in this watchlist, but its rank is red, which means it didn’t pass the original quant, and if we mouseover its score we can see why. It looks good, except for the fact that its Dividend 1-year change is 0%. That is not a good sign for a dividend grower, so we’ll move on. Let’s see what happened to AVP. 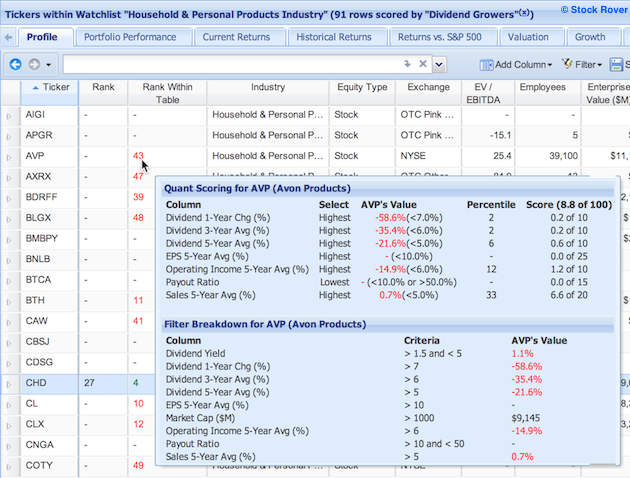 AVP is buried all the way down at number 43 in this watchlist and didn’t pass the original quant, and when we mouseover its rank, we can see that it failed the dividend growth criteria, and its Operating Income and Sales 5-Year Average were poor. So while we saw that its six-month return was high in the Peers tab, we are looking for dividend growers, so we’re not going to consider it further. 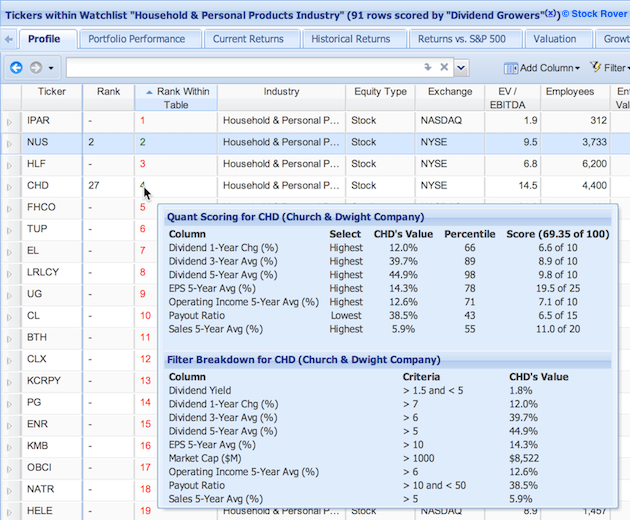 But, there is one other stock that passed the original quant in this industry, and that’s Church & Dwight Company (CHD), ranked number four in this industry according to our criteria. When we mouesover its rank, we can see the quant score. We can see that it’s growth isn’t quite as robust, but it looks all-around pretty solid. We’ve found another intriguing stock in NUS’s industry, and in the next post we’ll to compare these two competing stocks head to head to see if either of them are worth committing capital to.